The Nebraska Department of Agriculture (NDA) has become aware of an issue that, although not new, warrants the attention of private and commercial pesticide applicators involved in agriculture. Since approximately 1993, use of products containing atrazine has been prohibited within 50 feet of any well, whether it is in use or abandoned, as atrazine can contaminate groundwater. More recently, products containing acetochlor also have restricted use around wells, but only in cases where the depth to groundwater is less than 30 feet and the soil types are sandy (sands, sandy loams, and loamy sands) and also low in organic matter. Within the last several years, products containing both atrazine and acetochlor have labels with the well restrictions for both active ingredients in the environmental restrictions section. Often, the less restrictive statement for acetochlor is given first, along with an eye-catching diagram showing a well and conditions where those acetochlor restrictions should be followed. This is followed by the atrazine restrictions, which are more restrictive than those for acetochlor. Any product containing both acetochlor and atrazine must follow the more stringent atrazine restrictions and are prohibited from being applied within 50 feet of any well, regardless of soil types, percent organic matter, and depth to groundwater at the well (see figure below). 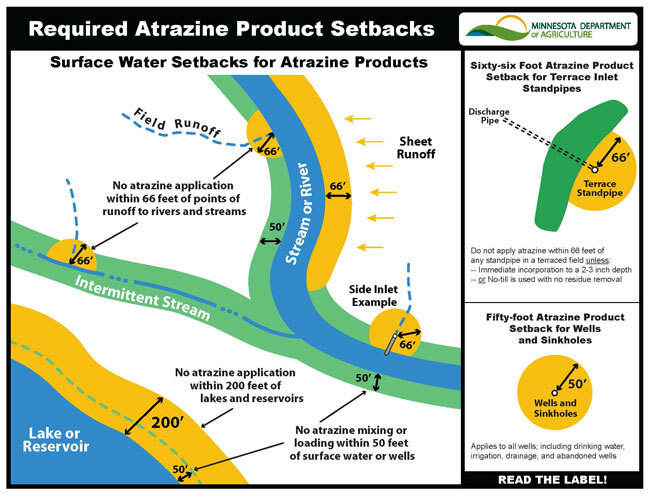 Atrazine products also have use restrictions for protecting surface water, namely, setbacks near streams, rivers, lakes, and reservoirs, as well as considerations for fields with tile outlets. These restrictions must be followed, as indicated by the label, for all product mixtures containing atrazine. NDA wants to protect the state's water resources and ensure compliance with label directions and the Nebraska Pesticide Act. Direct any questions concerning pesticide label directions, product registration, applicator certification and licensing, or the NDA pesticide enforcement program to the NDA at (402) 471-2351.